Let everyone know you love to play poker with one of these Poker Player Personalized T-shirts. Dad, Papa, Grandpa or Uncle will look great on Father's Day sporting their new personalized shirts. Your Personalized Poker Player T-Shirt is available on our premium white 100% cotton Personalized Shirt, machine washable in adult sizes S-3XL. Also available in Ash Gray. Includes FREE Personalization! 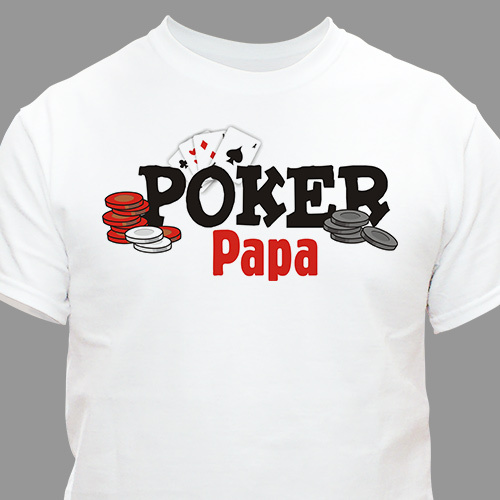 Personalize your Poker Player T-shirt with any name. Fun shirt! My dad actually put the shirt on right after he opened it! GiftsForYouNow.com has a collection of Personalized T-Shirts. Our Personalized T-shirts are perfect for Christmas, Mother's Day, Father's Day, Sweetest Day, Valentines Day & Birthdays. Create a custom printed T-shirt for someone in your family today. Mom, Dad, Sister, Brother, Grandma or Grandpa will love this wonderful personalized t-shirt which you have customized just for them.